You read that right - Damart! I've featured them before and it's my pleasure to do so once more because they've produced a real humdinger of a look book for SS15. The brand is typically aimed at an older demographic and they are famous for their thermals but they're also innovative and have in the past few seasons succeeded in looking beyond that demographic with some amazing styling and photography. Here are some of my favourite images from this season's lookbook..
Now it's more formally styled in this shoot so I went for casual with my Gap jeans, denim shirt and slip on trainers. 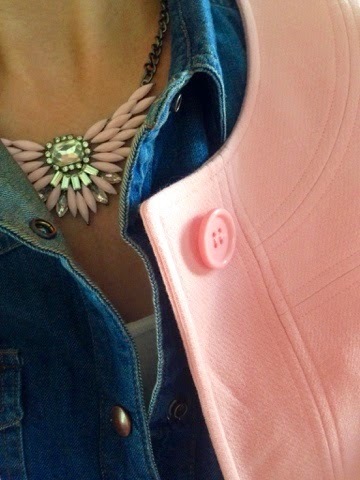 With a bit of pink at my neck in the form of the Phoebe Blush necklace from my own shop. and one photo taken outside - the only one from 23 that was usable <sigh> but at least it helps you to get a feel for what it looks like from a distance! It's a great weight for now - not too heavy...but with some warmth in it for the cooler days we've been having. As well as working well on the school run, I think it would be fab for the races or for a wedding. But I have neither to look forward to so I'll be wearing with ripped jeans and t-shirts for the foreseeable. Size-wise, it's a big fit. I'm wearing the 10 here and it fits more like a 12. Thanks to Damart for giving me the opportunity to feature this stunning coat and thanks to you for supporting the brands that support this blog. 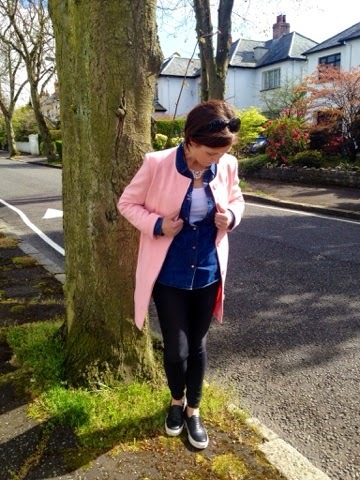 Gorgeous pink coat, you look lovely! Wow, when did they get so good in their styling - I love the pictures. 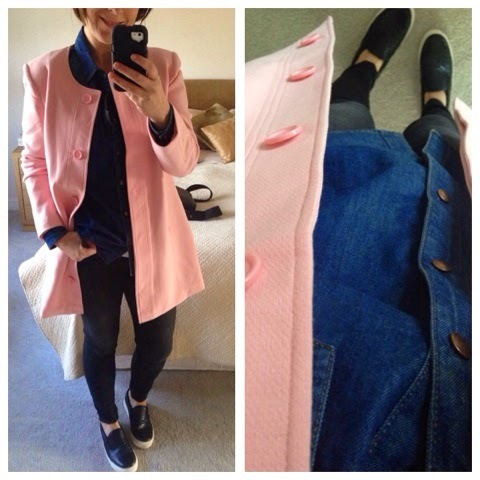 That pink coat is a staple wardrobe item. Looks GREAT against the denim.